In a seemingly impromptu press conference, President Trump on Monday blamed Congress for inaction on key campaign promises like health care reform -- saying they are "not getting the job done." According to a new poll, American Republicans may think Capitol Hill inaction within their own party is intentional. The new poll from CBS News reveals 39 percent of Republicans feel congressional lawmakers of their own party "don't like" Trump and are actively trying to undermine him, while an additional 37 percent think congressional Republicans don't like President Trump "but pretend to" in order to try to get their agenda passed. That's a total 76 percent of Republicans who believe GOP congressional leaders do not like the sitting president of their own party. The poll also shows a slim 20 percent of Americans think that congressional Republicans should "do what the president wants" because he's their leader. These findings come as tensions fuel between the 45th president and those Capitol Hill dissenters who voice opposition to Trump in legislative and personal ways. That list has previously included Sen. Bob Corker, Sen. John McCain, Sen. Lindsey Graham and even Senate Majority Leader Mitch McConnell himself. Speaking out on the legislative branch's inability to move forward Trump's most central campaign pillars like a repeal and replace of Obamacare and U.S.-Mexico border wall, former White House chief strategist Steve Bannon said recently that he would back candidates challenging incumbent GOP officials -- a strategy McConnell was quick to shut down on Monday. "You have to nominate people who can actually win. 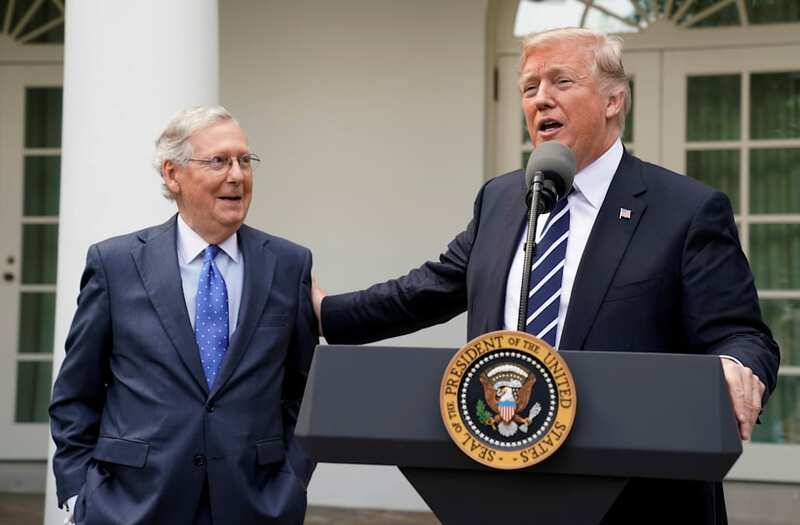 Winners make policy and losers go home," McConnell said. "Our operating approach will be to support our incumbents and in open seats, to seek to help nominate people who can actually win in November. That’s my approach ― that’s the way you keep a governing majority."